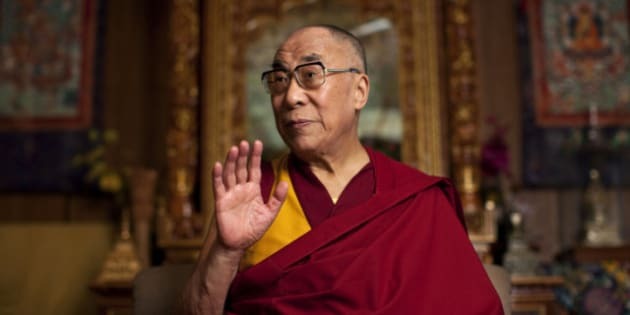 OTTAWA - The Harper government firmly aligned itself Friday with one of China's sworn enemies — the Dalai Lama, who thanked the world for its support of Tibetan Buddhists under siege. His voice resonating through Ottawa's historic, high-ceilinged conference centre that was once the capital's main train station, the charismatic, orange-robed Tibetan holy leader said his "ancient nation, with ancient culture, is in danger of dying." "As fellow human brothers, sisters really showing us your solidarity, and you really want to do something, I very much appreciate," the Dalai Lama said, leaning over his dais to address the Sixth World Parliamentarians' Convention on Tibet. The gathering included parliamentarians from around the world, including MPs from Canada's three main federal parties. They were discussing the dire and deteriorating situation of the Tibetans, who have witnessed the self immolation of more than three dozen monks over the last year to protest China's oppression. The Conservatives have grand trade ambitions with China, which considers the Dalai Lama a dangerous separatist. But several Tory caucus members were on hand to lend support to the Tibetan cause, including Sen. Consiglio Di Nino, who heads the Canadian parliament's Friends of Tibet group. Immigration Minister Jason Kenney told the conference the government supports the Dalai Lama, a Nobel Laureate on which Canada conferred honorary citizenship in 2006. Kenney reiterated Canada's commitment to open an office of religious freedom within the Foreign Affairs Department, as well as a 2008 statement from Canada calling on China to respect protests and enter into meaningful dialogue with the Dalai Lama or his representatives to peacefully resolve the Tibet issue. "We continue to have encouraged positive dialogue with his holiness," Kenney told the gathering. The minister remained at the conference's head table for the Dalai Lama's speech. Prime Minister Stephen Harper later privately welcomed the controversial and popular exiled Tibetan spiritual leader to his Parliament Hill office Friday afternoon. The Prime Minister's Office released a photo late Friday of Harper greeting the Dalai Lama. Harper's office billed the meeting as a "private courtesy call," in an apparent a gesture to soothe any hard feelings with China. The developments will not be viewed favourably by China's Communist government. The Conservative government has ambitious trade ambitions with China, and understands that Beijing does not take kindly to Western governments showing the Dalai Lama hospitality. But that didn't matter to some Tories at the gathering. "I think China is going to buy oil and wheat and chemicals and iron ore. They need that stuff. They want that stuff," said Alberta MP Rob Anders. "Whether or not we draw attention to human rights abuses or to their diplomatic oversteps, to their intimidation or diplomacy or whatever, they're still going to need those supplies." Opposition MPs backed the Conservatives in their show of support for the Tibetan cause. New Democrat MP Peggy Nash, whose Toronto riding is home to more Tibetan immigrants than anywhere in Canada, said Kenney has an active history of supporting the persecuted group. "Acceptance of dictatorships perhaps diminishes our own democracy, so we should be working to promote democracy," she said. "That's a positive thing to do and I see the minister's support in that context." Liberal MP Irwin Cotler, a longtime human rights advocate, said he was happy to see all-party support for "one of the greatest heroes of our time." "I'm glad that the minister was here. I think that the Dalai Lama and his cause deserve support. This is not a matter of party, it's a matter of cause." The Dalai Lama showed trademark humour, kicking off his speech by telling Kenney, "Canada belongs to the Canadian people, not to your party (or) other party," before breaking into one of his trademark giggles. But the immensely popular 76-year-old Tibetan spiritual leader, who fled his homeland in 1959, nine years after Chinese troops invaded the Himalayan plateau, also delivered a profound update about the resiliency of his people and the prospects of democratic change in China. The international supporters of Tibet are "spokesmen for Tibetan people inside Tibet," who cannot express their views, and who "simply carry fears and suffering, day by day." Earlier Friday, Hollywood actor and Tibetan Buddhist activist Richard Gere called on Harper to meet the Dalai Lama in public. Gere, in Ottawa for the Dalai Lama's visit, said Harper should do more. "The positive thing was that he met him. The less positive thing is that it wasn't public," Gere told reporters at the conference. Harper angered the Chinese Embassy when he met the Tibetan leader in 2007, but has since made two trips to China to boost trade with the Asian economic superpower. "I have no trouble with trade with the Chinese, but to diminish ourselves in the process is a double death for the Chinese people, because it perpetuates the totalitarian state and it kills us in the core of who we are," said Gere. Gere chaired a panel discussion at the Friday meeting and called this a "delicate moment" in the history of the Tibetan movement. Former Liberal prime minister Paul Martin became the first Canadian leader to host the Dalai Lama in 2004. Martin tried to assuage China's concerns by meeting the Tibetan leader on neutral ground at the home of Ottawa's Roman Catholic archbishop. What&#039;s In Canada-China Trade Deal?